Hi everyone - we all hope you had a great weekend and now for the Crafty weekend again! We have a great challenge this week and the winning entry will win a brand new Candy Doodles Collectors Edition CD! Woohoo!! This CD is STUNNING, so make sure you get your entries in to win! So onto this week's challenge! 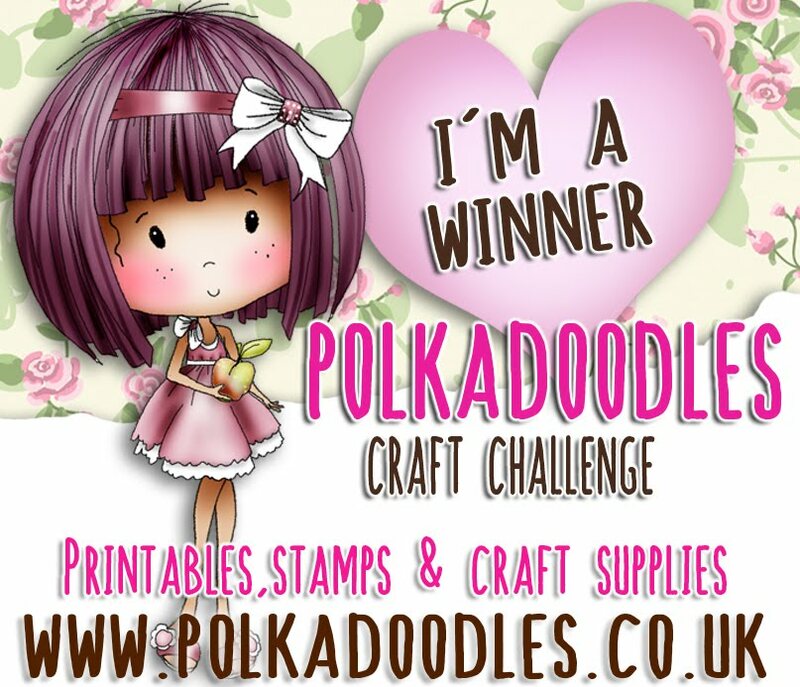 Joni here and this week I am hosting the Polka Doodles Challenge: Cabin Fever! Let's see your summery designs. 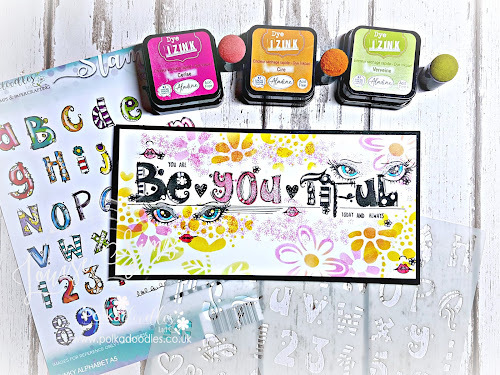 The Design Team are allowed to use a Stashbox Stamp this week - we love using our Polkadoodles products with our other stash we have because they're so versatile! 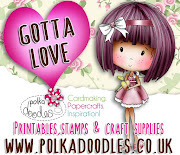 Nikky's designs complement lots of other craft ranges which is really unusual, very often you buy one Design brand and you have to use it on it's own but not with Polkadoodles, we love that! 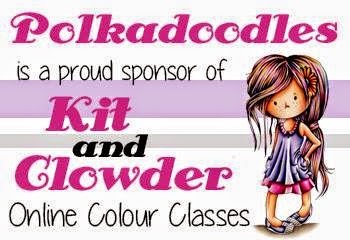 Don't forget you have until Sun 4th March to enter so let's see all your lovely creations! 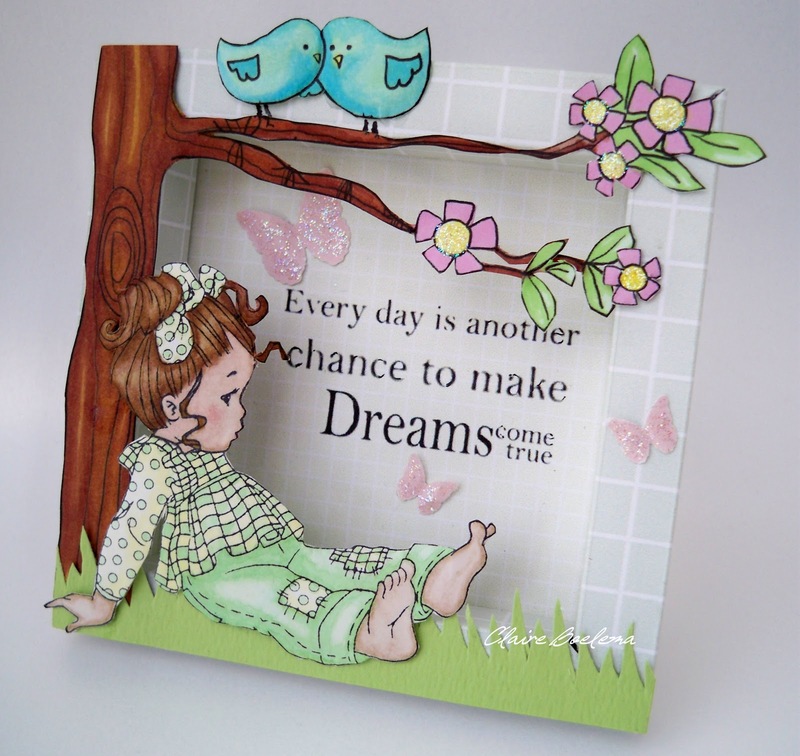 For my card I used the Fairy Flutterfly Gracie stamp with "A Wish for You" Sentiment. I printed out some bright pink summery paper from the Sugar Birdies CD. Emma, hello there, this week, I have made a gorgeous summery card with juicy lemon colours and my favourite Magnolia stamp of the moment. I coloured with Prismacolor pencils, created the punched mat with a Martha Stewart Punch Around The Page set. The flowers and backing paper are all made from papers on the Polkadoodles Pretty Sweet CDRom, finished with a scattering of gems and a lovely little bow. Nelly hello everyone, for this weeks Summery card i couldn't resist using this BBQ themed image from my stash box and coloured with Pro Markers. I have used the design papers from the Pretty Tuff CD the ivy and bird box die is from Marianne design. 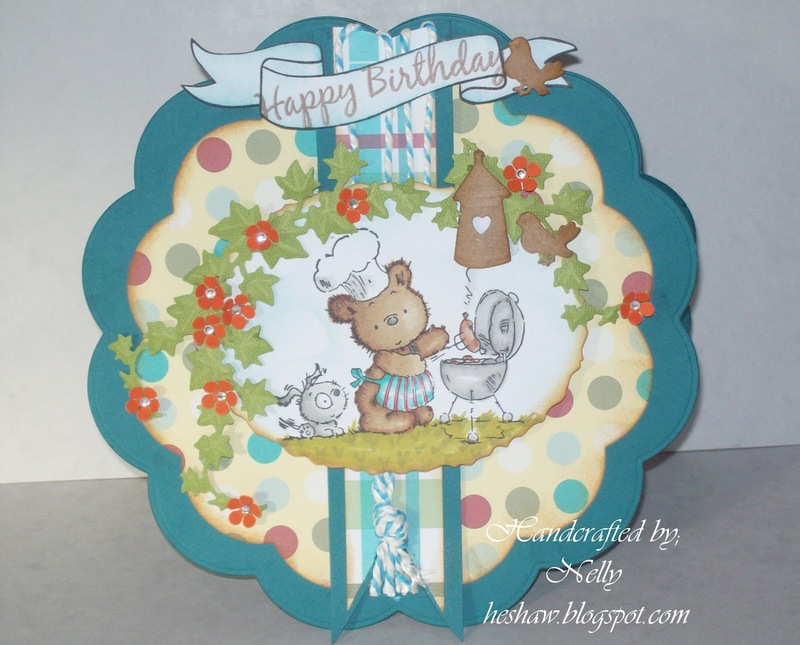 Shary - I've made my summery card using the gorgeous green and yellow papers from Sundae of Seasons. I also used the same papers to punch my flowers. The ticket sentiment is from the brand new Candy Doodles CD. My stamp is a Gorjuss girl coloured with copics. Norine - what a fun challenge this was - to get all summery!! 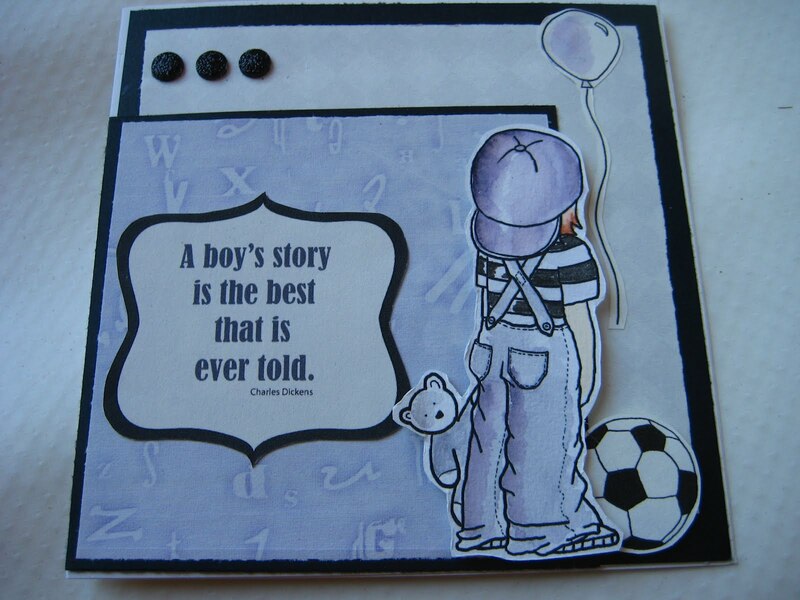 I used a stamp from my stash, by Lockhart Stamp Co and all the papers and journal circles from Polka Doodles. Specifically, the papers are from Sundae of Seasons and Pretty Tuff. Coloring done with Copics. 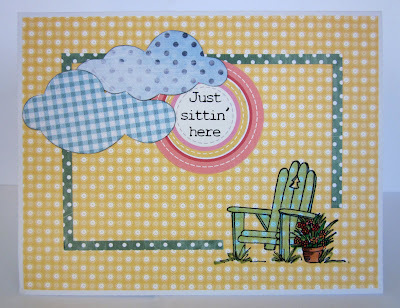 Clare - I've always loved this summery stamp by Penny Black. 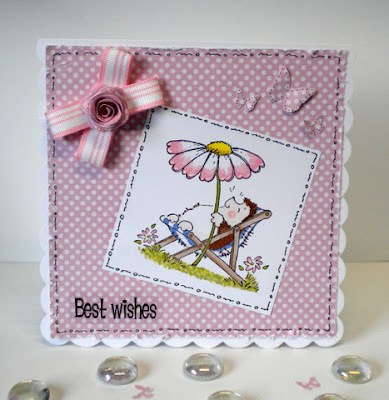 It goes perfectly with the Polka Doodles pink polka dot paper from the Christmas Boutique Magazine. I've added a pretty flower from a Marianne rose die. NJ - For my summery card I have used the Candy Doodles Collector's Edition CD. I found this Ladybug and friends stamp in my crafty stash which I forgot I had! I have coloured this using Letraset Flexmarkers. ﻿Shell- For my cabin fever card I've use some gorjuss dotty papers from the Pretty Tuff CD, the image I thought was perfect for this challenge and she has been coloured with a mix of pro markers and copics, the sentiments is off the Candy Doodles collectors edition CD. I then just added ribbon and buttons from my stash to finish. Claire - I've made my cute little box frame using some of the yummy papers and images from the new Candy Doodles Collectors Edition teamed with a stamp from Elisabeth Bell and some punched butterflies. So there you have our inspiration this week - didnt the girls all do great! Make sure you get your entries in by Sun March 4th at noon and REMEMBER! No more than 10 other challenges! Week 7 - Recipe, Blog Candy & Exciting News! My, we have LOADS of exciting news for you this week everyone! Firstly, make sure you check out Create and Craft TV on Sunday at 9am and 2pm to see Nikky launching something you will completely LOVE!! We can't say any more but there is a little sneaky peek amongst the cards this week and you might be able to find a little snippet here...We have now shipped out all the first issues of the Pen & Paper Circle kit which we absolutely adore, and the 2nd issue is now on pre-order here - you only have until 7th March to order so don't miss it! 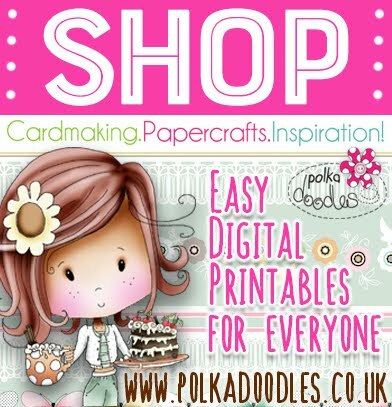 are now very kindly sponsoring Polkadoodles blog! WOOOHOOOO!! We're all so excited!! 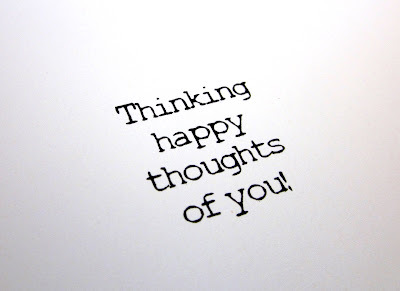 So watch out for lots of fabulously delicious blog candy and blog hops and...oh, allsorts of good things coming up!! 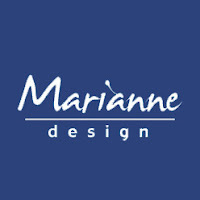 The Polkadoodles design team all completely ADORE Marianne Design products - they don't just have dies you know, they make stamps, ribbons, papers, an array of beautiful products we all love! So, today Marianne Design are sponsoring this challenge by offering up some totally amazing blog candy! This includes a fabulous stamp (well, 3 stamps), a beautiful lace Creatable which we all just adore (need to get my hands on that!) and some beautiful ribbon to co-ordinate. In addition, to mark the occasion we are also going to throw in a Polkadoodles Candy Doodles CD - the total value of this candy is over £35! So enter this week's challenge and we will choose one random lucky person to receive all these goodies. This candy is in addition to our normal 3 top prize winners. Good morning everyone!! 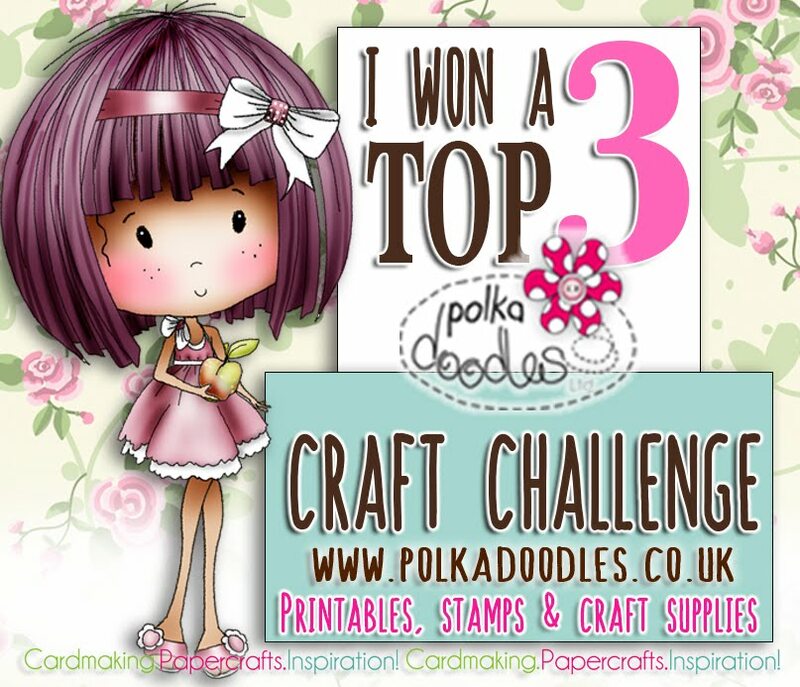 Welcome to a brand new challenge here on Polka Doodles. Congratulations! please email Nikky for your prize and blinkies - the first placed winner also receives a free download! Please put in the subject field of your email your placing and the challenge number. Deadline for the challenge is Sunday 26 February at 12noon GMT - Good luck!! Anne - What do you think of this little lady then? Cute as a button isn't she? Watch the shop for details of when she'll be arriving. I've coloured her with copics and used my prisma pencils for the grass. 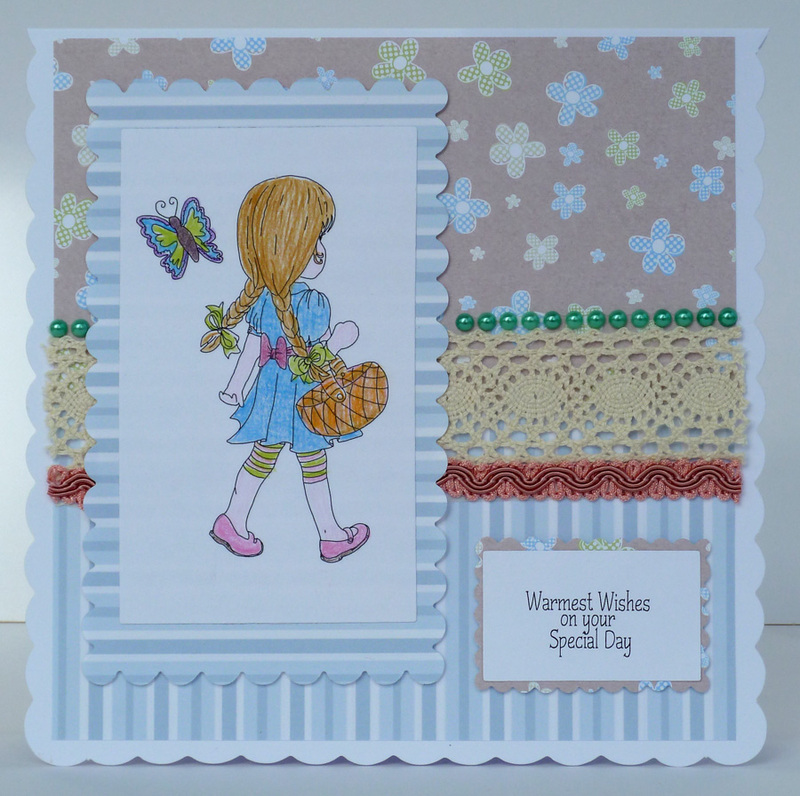 I've used the Candy Doodles CD for the papers and the little butterfly which I printed twice onto some vellum and decoupaged. I've stitched this onto the card through the pearls as I didn't want to risk the glue showing through. A ribbon and a few little flowers with pearls for their centres completed my three embellies. Ruth: I've used papers and the digi bird from Candy Doodles (one of my favourite Polkadoodle cd's!) 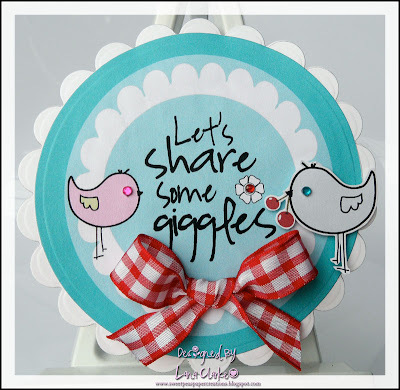 The birds have been coloured with Promarkers and I've added some bits and bobs from my stash along with a Mariane Designs Die. We have a baby due in the family any day now and I'm just playing it safe with a pink and a blue card! 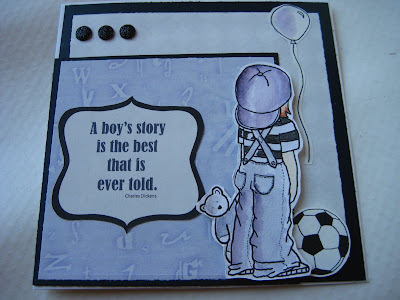 Josie: This week I used a Bells n Whistles rubber stamp coloured in with a mixture of Pro Markers and Flexi Markers. The backing papers are from the Magical Winter CD Rom. For my embellishments, I chose the lovely metal butterfly, gems stones and a sentiment. Claire: I have used one of the pretty sweet girls, papers from the Paper boutique Vol 1 cd, as are my embellishments ( cake,stripey frame and scalloped semi-circle). Patty: I have used one of the Pretty Sweet Girls, from the Paper boutique Vol 1 cd and my embellishments are ( White twine, Paper flowers & white Brad). Lana - I have used the fabulous 'Candy Doodles' CD for my card. I love bright, bold cards and seem to always make a shaped card. If you look closely you will see 3 tiny gems on my card and to finish it off I added a cute little gingham bow. Enfys: I carried on with my resolution to use up papers/images I have already printed out, and interpreted the 3 embellishments as three different ones (flowers, foliage, pearls). The frame was cut using Elegant Edges on my Cricut, and popped up with dimensional foam pads, the owl is from Back to Nature, coloured with Promarkers. The flowers and foliage were punched - photos of the punches I used on my blog. Doreen: I used for my card a image and paper from the wonderful Pretty Sweet CD. Love the paper. I embellished with little butterflies and pearls. Miria I love all the shadows of grey papers from cd Pretty Tuff and I used two of them for my card, the images are from the same cd. I coloured them with Kuretake Zig Art&Graphic and Wink of Stella,I added three rhinestones as a final touch. Fliss I've made my recipe card from the Double Sprinkle Of Kraft CD which is a real favourite as I love the papers on there. I printed out the pretty image and coloured her with pencils. I then cut her out with a die and added to a mat. I added 2 papers to the scalloped card blank and chose pearls, crochet lace and braid as my 3 embellishments. Daniele here, For my recipe card I thought I'd give you a seek peek at one of the new images from the new Cd coming out real soon .....ohhh so sweet. I coloured the image with Promarkers and Flex markers, I also intrepreted the three embellishments as three types, its sooooo hard to only use 3. So there you go, our inspiration for this week! Hope you have fun and join us in this challenge! The challenge ends on Sunday 26 February at 12noon GMT and please remember our rules!